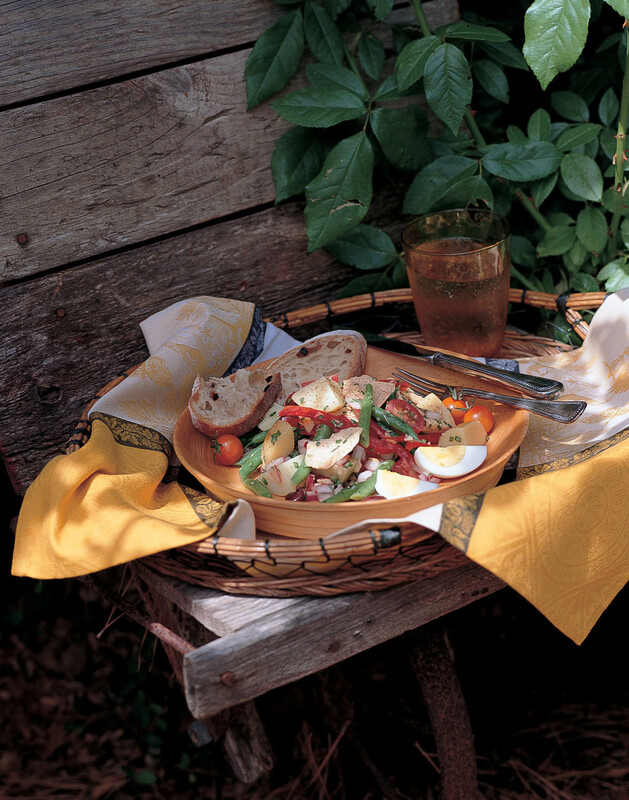 This classic Provencal salad is said to originate in Nice, France. Many modern Nicoise-style salads include fresh grilled ahi tuna, but I prefer the imported canned variety packed in oil for a more traditional recipe. Look for small, bright green beans for sweet tender flavor. You can also use fingerling potatoes and just cut them into thin strips. I prefer hard-boiled eggs to have a bright yellow center that offsets the other colors in the salad. The best method is to bring the eggs to a boil and then turn off the heat, cover them for 9 minutes. Cool and peel. Nicoise olives add a briny meatiness to this zesty vegetable and tuna mixture. A classic Nicoise salad always include some anchovies so feel free to add them if your group likes them. I am fond of the Spanish white anchovies that come refrigerated and are milder and sweeter than their canned cousins. 1. In a large pot of boiling water, cook the potatoes until tender but slightly resistant when pierced with a fork, 20 to 30 minutes, depending upon their size. Drain and cool. When cool, peel and cut into julienne slices. Place in a large bowl. 2. In a medium saucepan bring water to a boil. Immerse the green beans and cook until tender but slightly resistant, 5 to 7 minutes. Drain and place in ice water to stop the cooking. When cool, drain well and place in the bowl with the potatoes. 3. Add the carrots, red pepper, olives, red onion, capers, basil, black pepper and half of the tuna to the vegetables and toss to combine. 4. To make the dressing, combine the garlic, mustard, basil and lemon juice in a small bowl. Slowly whisk in the olive oil until thoroughly combined. Add salt and pepper to taste. 5. When ready to serve, use just enough dressing to moisten the salad. Toss carefully to combine, making sure not to break up the capers. Taste for seasoning. Mound the salad high in a large, shallow serving bowl. Place the remaining tuna (and anchovies, if desired) on the top of the salad. Spoon a little dressing on the tuna. Alternate the egg wedges and tomatoes around the outside edge. Garnish with basil leaves and serve. Serve extra dressing on the side. Tip: To julienne a vegetable, cut it into a rectangle and then cut into thin slices one way and then cut into thin slices the other way creating long, thin strips that look pretty in the salad. Advance Preparation: This may be prepared through Step 4 up to one day ahead. Cover and refrigerate the dressing and the salad.